I am assuming Ms. Shepherd favors a rather literal interpretation of the all-time best selling Bible (the Christian one). The Bible is largely silent on the flat/spherical earth debate, besides a reference to “the circle of the earth” (Isaiah 40:22) – which rather suggests a 2D earth. So be it. I believe there is a market for the flat-earth globe, and am certainly willing to entertain proposals for licensing this innovative flat orb. 1. Create an azimuthal equidistant map projection centered on the north pole. A bit of color and a few place names were added to mine, but you don’t need to do this. I printed the globe on a large format ink-jet printer at 1500dpi, but a smaller low-resolution ink jet print would work too. You can use the great free software package GProjector to create the azimuthal equidistant projection. For Projection: select azimuthal equidistant; for the Overlay: one of the Earth outlines that comes with the software, set the Lat to 90° N and the Radius: to 180°. Download flat Earth PDF suitable for printing: with (here) or without (here) text around edge. 2. Visit a well-stocked craft store. They usually have thin pressed-wood circles of different sizes for less than $5. Select a wood circle that fits the diameter of your flat-earth globe. 3. Carefully trim the circular flat-earth globe with a sharp blade, using the wood circle as a guide. 4. Glue your flat-earth globe to the wood circle. 5. Craft a stand: I found an old globe at a yard sale and removed it from its stand. 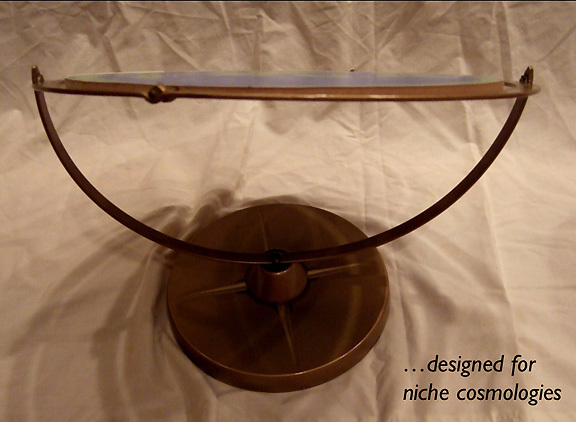 I then drilled two holes in the side of my flat-earth-globe and fitted it to the stand. My globe was printed 12 inches wide to fit the stand for a 12 inch globe. BTW, there are those of us who do not believe that the theory of evolution is a sound one who do know that the earth is round. Frankly, if you don’t believe the theory of evolution is sound, then A) you have no clue what a scientific theory is, and B) you’ve been keeping your head in the sand during literally every biology class you’ve ever taken. The entirety of modern biology and taxonomy depend on natural selection, which is a PROVEN phenomenon. The THEORY is just the explanation of HOW evolution happens, NOT whether or not evolution happens. Anyone with a dog can see that evolution is real. Hi Brian. I’m a little confused by your post. Are you just stating that evolution occurs in nature, but the theory is just a theory. Or are you stating that all creation has evolved into what it is today? I have a dog, but have never seen her evolve. Would you mind clarifying your thesis? The problem, of course, would be the carefully imprinted markings on the existing “globe holder” and their correspondence to the new, improved “flat earth” disk. :) But very interesting nonetheless, and worthy of creating for teaching purposes. Perhaps you would find a willing market in cartography and introductory geography classes around the country. What do you think your break-even point would be? I enjoy your blog, John, and often think it’d be fun to get together for old times’ sake. I am passing this post along to friends in NASA and, um, certain federal entities. It will come in handy if Gov. Huckabee is successful in his presidential bid. I love it!! …and want to put one in my backyard garden. Any thoughts on how to adapt these instructions to create a flat-earth globe that will withstand the elements? I’m curious to know what’s on the reverse side of the circle. One possibility might be a mirror image of the map pictured in the photos, as if the continents continued through the thickness of the circle. Another one might be an azimuthal equidistant map projection centred on the north pole. Right now the verso of the flat earth is black. I guess the dark depths of hell? I will have to see if there is any theological guidance as to what should be on the underside. So have you ever made the mythical “globe of a state”? yes – i do have a globe of Wisconsin. watch for it in a future post. You people are silly. Science has clealry already proven that the Earth is indeed spherical in shape. If this were not the case, then how did Magellad sail around the world without falling off the purported “edge” you would have people beleive. And his crew was summarily executed for the heresy of a flat earth. The Church has always historically been very hush hush about the truth–them and their round earth. Bastards! I suggest a turtle for the reverse image. Or Darwin. Just to clarify, the verse in Isaiah is commonly misinterpreted because most Christians don’t read Hebrew (that’s why Jews never have problems with this verse). The word that is always translated it the Hebrew word “chuwg” which means compass. It is meant to say that the “curtain of God” covers all sides of the earth. This verse has nothing to do with the shape of the earth. It’s been a long time… where is the globe of Wisconsin? Thankfully we have elected a new president, Barack Obama. Only the liberals can stop the corporations from dumping garbage and atomic waste off the edge of the world. The more we dump garbage off the edge, the more it increases the effects of global warming. Also, since carbon dust is heavier than air, it also escapes the surface tension of the atmosphere and drops off the edge. We have had 8 long years of de-regulated edge policy and virtually no international leadership on how to improve the edge and save the environment. Parts of the edge are made of melting ice that is holding the oceans from falling off the edge. There used to be a legitimate safety concern for keeping the edge secret. But those concerns are no only used to stifle debate about how best to protect the environment. This is fantastic. I stumbled upon your site while trying to make a large-scale Flat Earth map for my wall. As you can imagine, it’s not the sort of thing you can find in a shop. Anyway, thanks for the great tips. That software is exactly what I was looking for (although I didn’t realise it at the time). I added a link at the Flat Earth Society forums as well..
And He walks above the circle of heaven.” The earth is a representation of heaven when God made it. Heaven is a sphere and so the earth without the glories of Heaven is a sphere. In Psalms it says ” The Heavens declare the glory of God”. How could there possably be a flat earth when all other planets in the universe are spheres. A “circle” is not a sphere. My globe is a circle. Just being literal with regards to the word of God. I have believed the earth to be more of a cube for quite some time. Pacaso was the first cubist and he was a great insperation to me. If you think about it there are alot of cubes found in nature. Fore example, well, rocks can be kind of cube shaped i guess. What is earth but a big rock? You see to say the earth can be round is not likely as perfectly round things are not found in nature. I am from the Flat Earth Society, and we defend that the earth is really flat. The spherical earth mistake is one of the worst of modern science, and we are glad you provided this nice tutorial. We recommended you on our forums for our Flat Earth Theorists. Hey: I added a link to printable flat Earth PDFs to the posting. John K.
I would like to know if you could make one for me.I would love to have one if it’s not to expensive to make. 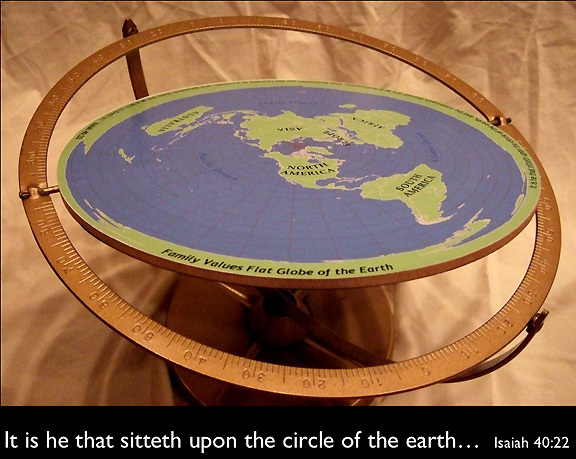 All the instructions for making a flat earth globe are in the posting – the hardest part is finding the globe stand. As far as I have been able to find out, no globe company sells only the stand. But you can find them in 2nd hand stores and on eBay. One you have the stand, the rest is pretty simple. Actually I think using part of the globe would make a better presentation, as Sheol is supposed to be found under the earth. Therefore, find a used globe, cut the top half off, paint the bottom half, and put the circular flat map on top of it. You could also put a dome over it. 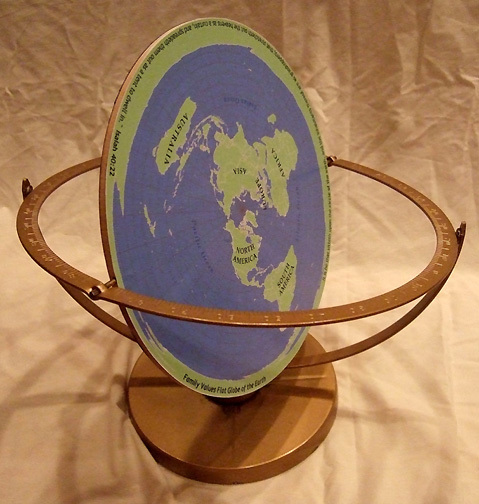 The few flat earth globes I’ve seen on ebay are made somewhat like this, they just don’t incorporate a globe stand into it. Looks like a fun project to me. You did an excellent job of explaining how to make it! Here’s my suggestion: make the globe unmovable. In my Biblical understanding, the Earth was set upon pillars. I think you created your Earth movable because the round hoax spins. We know the earth does not move but rather, the sun, moon and stars revolve around the earth. God bless, and thank you for making this model! I love it..i wish i could make one like this too.